Around 4:00AM on the morning of Sunday, October 7th, Bainbridge Public Safety received an anonymous tip on the whereabouts of Aaron Jones. 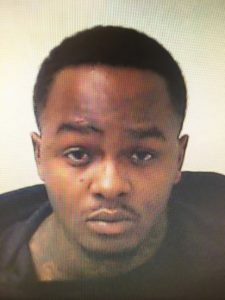 Jones was most recently involved in an incident with officers on September 4th in which he fled following a traffic stop, leaving his child behind (see story below). Jones has outstanding warrants and a probation violation and has been wanted since September 4th. The tip advised that Jones was headed to the Circle K on Tallahassee Highway, and that he was in possession of a firearm. When the tip came in, Bainbridge Public Safety Officer LaDaric Jones, Officer Mike Prindle, Sgt. Toby Miller, and Capt. Jack Bunting responded to the convenience store. Members of the Decatur County Sheriff’s Office also headed to the scene. Officers were ready and waiting when a car pulled into the station just after 4:00AM. The car came to a stop and officers surrounded the vehicle. Jones, the passenger in the vehicle, surrendered without incident. 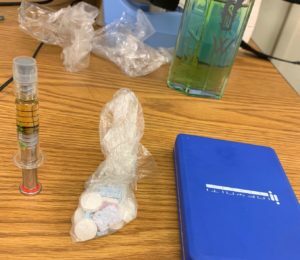 A search of the vehicle uncovered a book-bag belonging to Jones which contained a firearm and magazine, Ecstasy pills, scales, and 9.5 ounces of marijuana. He was arrested by Bainbridge Public Safety Officer LaDaric Jones and was charged with Possession of a Firearm by a Convicted Felon (Felony), Possession of a Firearm with Intent to Commit a Crime (Felony), and Possession of Illegal Drugs (Felony). Just after 8pm on Tuesday, September 4th, Bainbridge Public Safety Officer Jayson Myers made a routine traffic stop on a vehicle near the intersection of MLK Jr. Drive and Lamar Street. As Officer Myers approached the vehicle, he smelled a strong odor of green marijuana, and noticed a young child standing on the seat, unrestrained. The male driver provided his name and stated that he had neither a driver’s license nor proof of insurance with him, and that the vehicle was a rental. Officer Leroy Akins arrived on scene to provide assistance. Officers Myers and Akins approached the driver and asked him to step out of the vehicle. Rather than stepping out of the vehicle, the driver, identified as Aaron Jones, placed the vehicle into “drive” and sped off. Officer Myers returned to his patrol vehicle, activated his siren, and attempted to follow at a safe distance while keeping Jones’s vehicle in sight. He observed Jones run through a red light at MLK Jr. Drive and Sims Street, and then travel towards Wheat Avenue. As Officer Myers approached the intersection of MLK Jr. Drive and Wheat Avenue, he saw that the vehicle had hit a road sign and wrecked into a fence. He also noticed that the driver’s door was open. Officer Myers approached the vehicle and verified that Jones was not inside. Myers then checked the backseat and observed that the child was still inside the wrecked vehicle. Myers picked up the child who was crying but appeared to be unharmed, removed him from the vehicle, and then called for EMS to be in route. Several witnesses stated that they saw the driver exit the vehicle and run north in the direction of the railroad tracks. Additional BPS officers arrived on scene and began searching the area for signs of Aaron Jones. Once EMS arrived to check out the status of the child, Myers proceeded to search the vehicle. 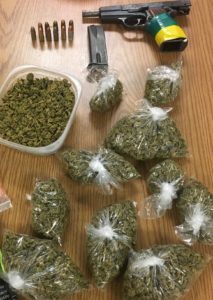 Located in the trunk was a child’s backpack which was found to contain drugs and paraphernalia including digital scales, two baggies of “Spice,” one baggy of “Ecstasy” tablets, two baggies containing powder cocaine, and eight 9mm bullets. After clearing the scene, the vehicle was towed.